Actually, the Bronx Zoo, formally known as the New York Zoological Park, was slated to open July 15, 1899. But heavy snowstorms the previous winter halted construction on the park for nearly four months. 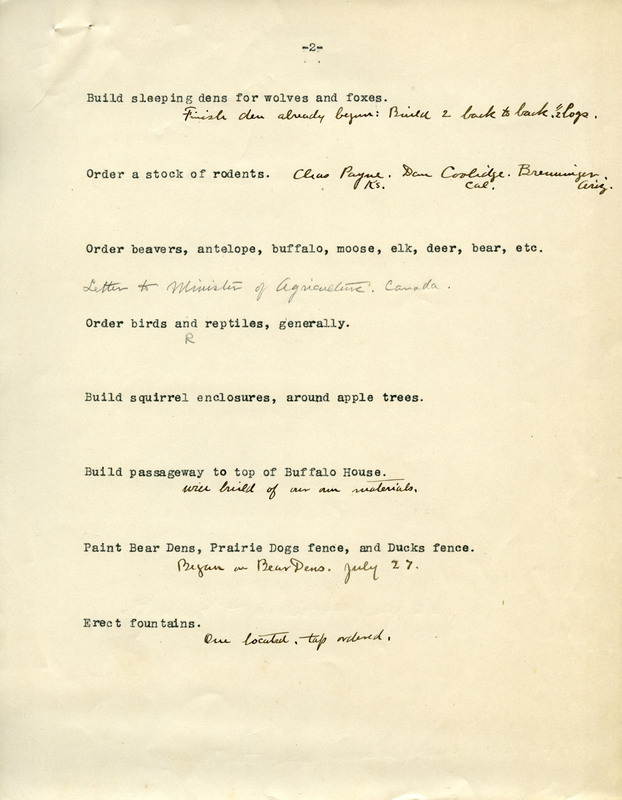 Indeed, by July 15, there was still much work to be done, as a To Do list held in the WCS Archives shows. From “Plan new water and sewers” to “Order birds and reptiles, generally,” a flurry of activities was underway. 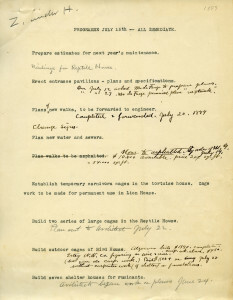 Pages from July 15, 1899 Bronx Zoo to do list. 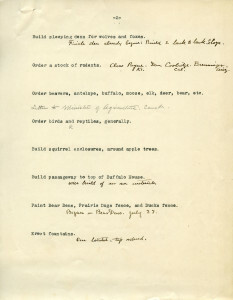 WCS Archives Collection 1001. 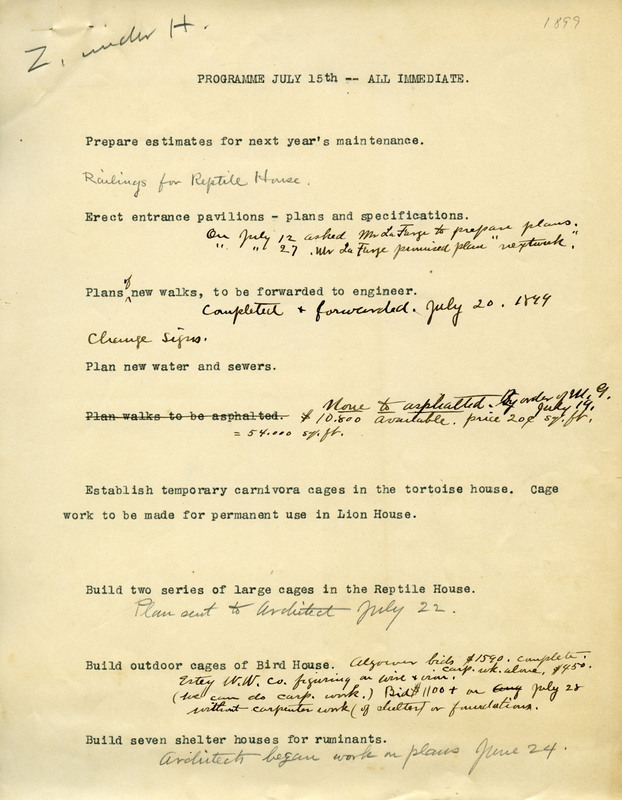 By November 8, 1899, though, the Bronx Zoo was ready for its debut. Arriving by special express trains arranged by the City, as well as by trolleys and even bicycles, over 2,000 visitors on that day flooded through its gates. At the Zoo, this opening-day crowd–a select group of politicians, philanthropists, celebrities, and scientists, as well as some ticketless visitors and neighbors–were dazzled by the animals, which numbered 843 on opening day. They toured the twenty-two exhibits ready on that day, including the Buffalo Range, the Ducks’ Aviary, and the Reptile House. 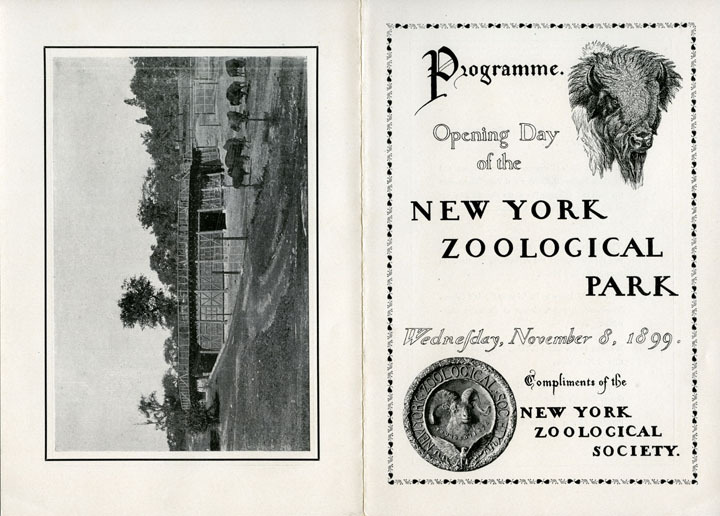 Covers of New York Zoological Park opening day program, 1899. WCS Archives Collection 2016. 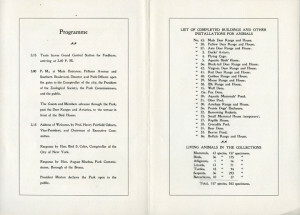 Inside of New York Zoological Park opening day program, 1899. WCS Archives Collection 2016. Before the end of 1899, over 90,000 people had visited the park. 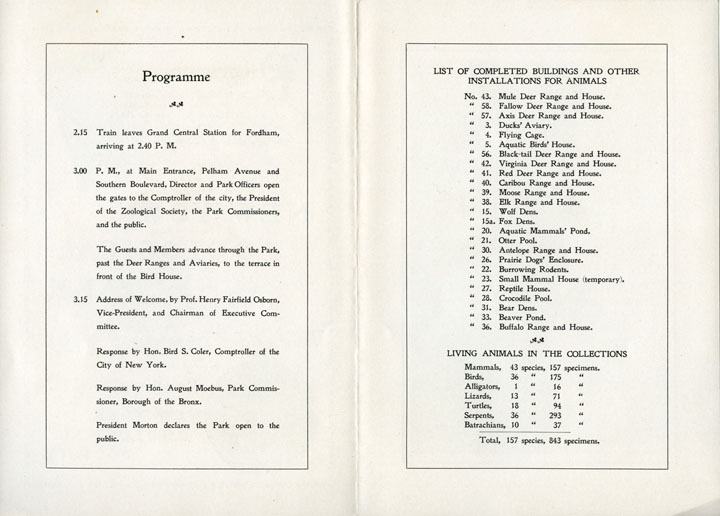 And since then, millions of visitors–from New York and across the world–have delighted in the Zoo’s wonders. So happy birthday to you, Bronx Zoo! And, happy birthday to us. In future posts, we look forward to sharing more of the treasures held by the Wildlife Conservation Society Archives, discussing new projects underway in the Archives, and presenting an inside look at WCS’s history.